Chances of rust on old project motorcycles throughout the U.S. based on average levels of precipitation. If a project motorcycle has been sitting outside for a decade or two, chances are it’s going to have at least a little rust. If you get lucky, maybe you’ll find a vintage bike that was stored properly and well protected during its hibernation, but those motorcycles tend to ask top dollar. At MotorcycleZombies.com we say the dirty the better when it comes to project motorcycles! But just how dirty is too dirty? We try to stay away from anything with rusted out frames which can be a common problem for old motorcycles that have been sitting outside in places that get a lot of rain and moisture. 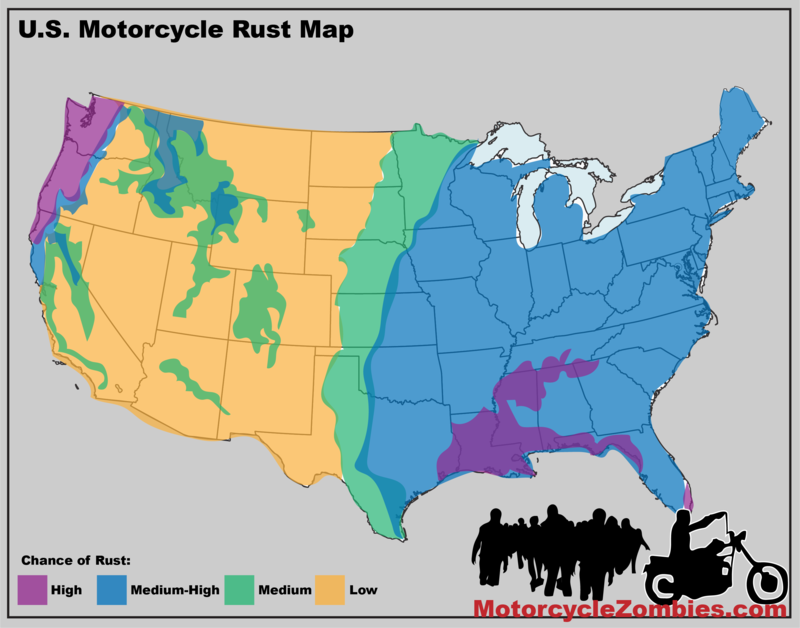 Our U.S. Motorcycle Rust Map above assigns chances of major rust based on average annual levels of precipitation for a given region. Old motorcycles that have been sitting outside, unprotected in places like the Pacific Northwest where it rains for much of the year or the South where humidity levels are high are bound to be much rustier than their counterparts in the desert. Often times rust on an old project motorcycle is unavoidable. Fortunately, must rust is not that hard to remove. Electrolysis makes quick work of rusty gas tanks. Using the same electrolytic method, you can even set up a system to remove rust from small parts too. Otherwise, rust can be removed fairly easily with a little bit of time and elbow grease. The most common challenge rust will cause both first-time and experienced home-builders is seized nuts, bolts, and screws. Again, you can take care of them pretty easily with a little bit of penetrating oil, heat, and patience. Rust can cause you some real problems if your gas tank develops pinholes or if it weakens your motorcycle’s frame. Have any experiences of your own dealing with a rusty project motorcycle? Share them below.